I absolutely love Michaels. The prices are great and I never have a problem. I own my own business and this is the best place for me to get the supplies I need for my flowers. Thank you so much! I was exceptionally pleased with Michaels Floral Supply. I spoke to Michael himself about the product that I was ordering, and he assured me that it was in stock and will get to me on time for the wedding. I actually started to recommend others to his site. The prices were great and I couldn’t ask for a better customer service. I am a first time customer. While there was a back-order by a supplier on one of the items selected, Michaels went the extra mile to ensure that I was satisfied by way of substitution (with my input) and even included extras at no cost to make up for the inconvenience. I also received a follow-up phone call. Now, that is what I call customer service! The product is exactly what I hoped it would be and it is perfect for my upcoming product line. If it takes off, I will take Michaels with me. Michael's Floral Supply is wonderful. in responding to questions as well as shipping. I FOUND EVERY ASPECT OF MY EXPERIENCE PURCHASING ITEMS FROM MICHAELS FLORAL SUPPLY TO BE POSITIVE. EACH ITEM SENT WAS IN EXCELLENT CONDITION AND ACCOUNTED FOR. I WOULD RECOMMEND MICHAELS FLORAL SUPPLY TO MY FRIENDS WHO ARE IN THE FLORAL BUSINESS LIKE ME. THE EMAIL NOTIFYING ME THE SHIPMENT WAS SENT WAS CORRECT AND ON TIME. THERE ARE TIMES I CAN NOT PURCHASE CERTAIN ITEMS ESPECIALLY, DURING THE CHRISTMAS AND EASTER HOLIDAYS. NOW I HAVE ANOTHER AVENUE THAT I WILL BE ABLE TO DEPEND ON. THANK YOU, MICHAELS FLORAL SUPPLY! Honest, good communication, super products and FAST mailers. What more could you want! I'm very happy to have you!!!! Shipping was fast and the order was perfect. Very nice people with good products and service. When I called for info they called me right back and were very helpful. I would order from them again anytime. Perfect in every way! I would recommend this merchant to everyone! wedding supplies. Its a great site with a wide variety of products. replied immediately and shipped quickly. I have purchased twice from Michaels and both times the customer service was excellent in all ways. A phone call I made with a question was returned immediately. I'll order from Michaels again. The merchandise is exactly what I wanted. The customer service and price is excellent. I will deffinitely go to this site again. Good price, prompt delivery. Im happy! Their website was very easy to navigate and locate the products I needed. The products arrived quickly and in good shape. They kept me informed about my order status via email and sent me a tracking number so I knew when to expect delivery. I searced other websites for similar products and found their pricing to be the best. I will definately buy from them in the future. I plan to shop with Michaels Floral Supply again in the future. This was one of the best online shopping experiences I have ever had. Excellent purchase experience. The only place on the Web we could find Floralife in a large container. THANK YOU! Great access to hard-to-find products. Thanks! I appreciate the outstanding service I received from Michaels. When one box was damaged, Michael took care of the problem instantly. 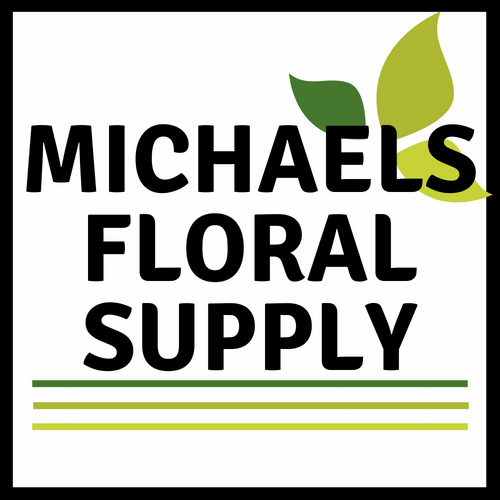 I will recommend Michaels Floral Supply to anyone needing floral supplies! Items arrived quickly and as promised. Superior customer service. Guarenteed satification. Very pleased with the ordering process and delivery. Received confirmation e-mail and delivery date. Product was delivered on time! Called with a question and was very polite. Appreciated the fact they called and just didnt assume and substitutue. Im happy to review this merchant. Id originally made my purchase through another merchant. In the end I cancelled with them after I found this merchant. I wish Id found them first. They filled my order quickly and correctly despite the fact I was a brand new customer. They understand the importance of qualitity customer service. The chances are high that I will be a repeat customer. Service was very fast and great which helped me make great flowers for my sons wedding! I will definitely use them again! Products were as described. Shipping a little slow but overall an easy transaction. I am very satisfied with the products. Service was prompt. Items arrived in fine condition. My supply of Floralife arrived sooner than expected. The package was beat up a little, but all the merchandise was there and it did not take long getting it. Shipping cost seemed high, but otherwise, our experience was fine. Great variety of items at good prices. Fast shipping with every item intact. A good experience and sale. I usually look for free shipping from the retailers that I usually shop with. Since I do most of my shopping on line, it really helps when it is free or a very low fee but I do understand the need to charge accordingly. Thanks to Michaels for bringing us these items on line. After I ordered the product online, Michaels Floral Supply sent me a confirmation email with estimated shipping date and the price charged to my credit card. When the item shipped, I received another email confirming the shipping. I want to update my review. I got an answer back from the merchant. He apologized for my bad experience and offered an excellent customer service. I appreciated the attention he gave to this matter. I found that they were very helpful in helping me find what I am looking for to do my daughters wedding. I will do business with them in the future. Everything was great. Ordering was easy, I received confirmation and my order arrived soon than anticipated. The 2 twig wreaths arrived in good condition and are unique in design. I will enjoy hanging them on my wall (if I can only figure how to). Excellent service! Showed real concern for making sure I was completely satisfied.